Ah….we all know the rush of adrenalin experienced at a conference. 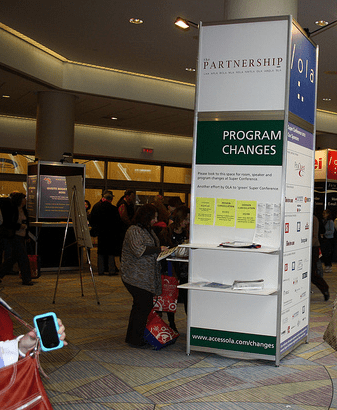 Many of us have just returned from a fantastic OLA 2012 Superconference – one of the best I’ve been to in Ontario in a long time. So much networking! So many people to contact, products to consider, ideas to explore, presentations to follow up on! So much learning! And………we all know that first week back at work. The conference is a faded memory already…..the notes we so carefully scribbled or typed set aside for—- ah, for—– for when we get time to look at them, discuss them with our colleagues, take action with them. We have the best of intentions, and too often, the worst of follow-up. I agree wholeheartedly with this tip – unless you couldn’t get on the wireless, which is sometimes the case; but typing your notes lets you quickly plug them into blog posts when you do get back to work, even if it’ your personal blog in which you can tag the topics and easily retrieve the info and ideas in 6 months when your brain says “wait a minute….I heard someone at OLA talk about this….”. If I don’t have my laptop or iPad, I type notes into my Blackberry to sync the docs or memo with my laptop. I know many people offer “Best Sessions I Went To” lunch talks to discuss what they heard with colleagues who weren’t able to attend. These conversations are fantastic and, really, should be expected of those attending. What people learn at a conference is useless if it isn’t shared and considered. There are lots of webinar platforms – even Skype – to share what you heard, learned and found interesting with colleagues in other branches or locations. Have a look at ooVoo as well – the quality is excellent. Archive the tweets of a conference and share with colleagues who don’t – or can’t – follow Twitter. Thanks to Rochelle Mazar at University of Toronto Mississauga for finding The Archivist Alpha to archive the tweets; I used to use TwapperKeeper but since Hootsuite assumed it, it seems to require “credits.” If you know a better way to archive tweets to be shared with those who can’t follow Twitter, please let me know. If you saw some products of interest, ask the vendors to come in to talk about them. Don’t be concerned that the vendor will push a sale; yes, sales are important, but more often than not vendors want to learn with you about the product – what questions do you ask about the product? What do you like? What improvements would you look for? Remember, vendors are our suppliers and our partners – without suppliers we really can’t create and deliver our services very well. So how do you take a conference back to work, and build on your experiences and your “ah ha’s!”? How are you using everything you learned, saw and talked about at Superconference last week?